FULANI HERDSMEN RENEWS ATTACK AT NIMBO COMMUNITY IN ENUGU, KILLS DRIVER. ENUGU— The last seems to have not been heard in the violent attack orchestrated by Fulani herdsmen whom have refused to let the residents of Nimbo community in Uzo-Uwani LGA have some moment of peace, following the attack at the community last Friday. 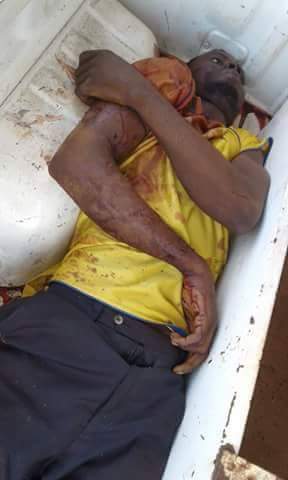 On Friday 8th July, 2016, at about 3 in the afternoon, a violent group of Fulani herdsmen stormed Nimbo/Ugbene road wielding AK 47, dagger and other dangerous weapons. The rampaging herdsmen descended on a driver heading to Nimbo, shooting him instantly to death and leaving him in the pool of his own blood. Read also:ENUGU MASSACRE: CATHOLIC CHURCH HOLDS PROTEST AGAINST FULANI HERDSMEN ATTACKS. During the attack, a passerby; one Mr Ugwu Alumona who witnessed what happened immediately raised an alarm, but the herdsmen whom absconded and vanished into the nearby bush as village youths approached the scene, did not leave without firing a shot at Mr. Alumona’s leg. While Mr. Alumona was rushed to Bishop Shanahan Hospital, Nsukka, for treatment, the identity of the driver was still unknown as at the time of filing this report. Read also:ENUGU MASSACRE: BIAFRA WRITERS VISIT TO NIMBO/UKPABI COMMUNITY. Though some security operatives was dispatched to arrest the ugly situation, palpable fear and tension had enveloped the residents of the community as the herdsmen are no where to be found but are still lurking the corners of the bush. It was further gathered that most of the villagers whom are still in fear and shock have deserted their community to nearby towns in search of safe havens.